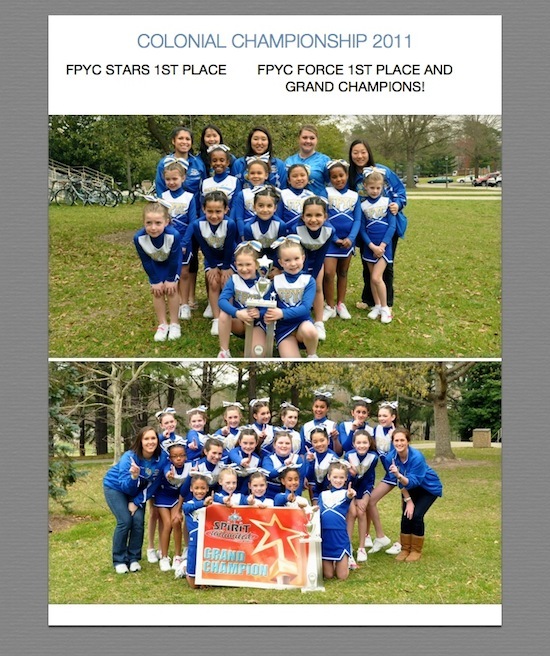 FPYC is proud to announce our partnership with Dynamite Elite Cheer!! Dynamite Elite Cheer will run our competitive co-ed cheerleading program. 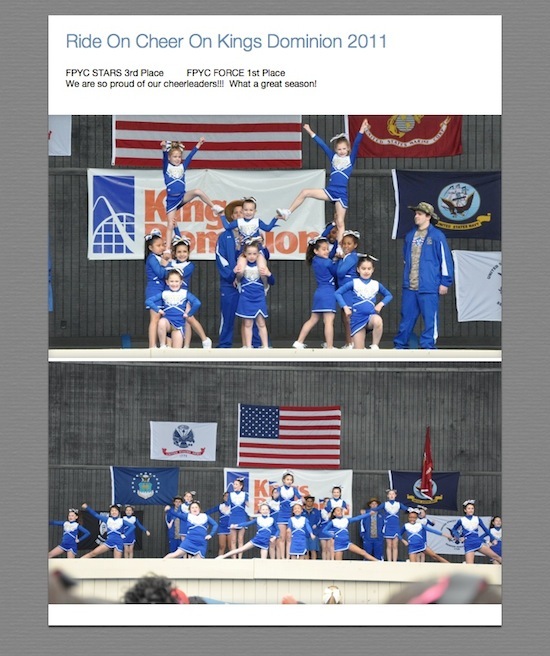 Dynamite Elite Cheer is a recreational 501c3 non-profit youth program here in the center of Fairfax County. Please visit their website for more details about registration, cost, etc. Since they are a recreational program they will compete against other recreational groups NOT all-star teams. 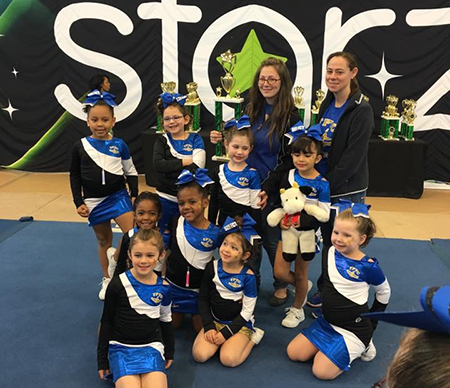 Our goal is to teach and improve the kids on their cheerleading skills all while having fun, making friends and memories, and learning life skills. We try to keep all competitions local and within driving distance. WHO IS ELIGIBLE for competition season with Dynamite Elite Cheer? Your cheerleader must have cheer experience and/or tumbling skills. All cheerleaders will also be evaluated for squad placement. The only exceptions will be if you have a child younger with strong tumbling skills and a strong desire for cheer. PRACTICES will be held at Lanier Middle School or Canterberry Woods Elementary School for 2 hours. Days will depend on squad placement. We do NOT have practices when FCPS schools are closed. Our 2015 season was amazing! Our Junior level 2 team, Blue Moon, traveled to Orlando, FL where they placed 1st in the AmeriCheer Internationals competition. It was a great experience for everyone involved and memories of a lifetime were made. 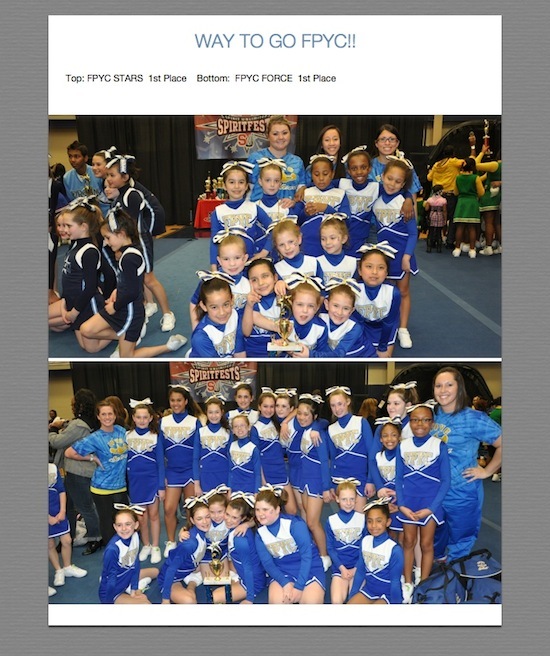 Our Mini level 1 team, Mini Moons, placed 1st at their very first competition ever! So proud of all of these girls. And of course we can't forget the awesome group of parents and families that supported these athletes in whatever they did. Whether it was a themed practice, competition, our holiday party, ice cream social, etc. We say thank you for everything! 2014 Season couldn't have been better! With two teams this year working on totally different levels and skills. We sent one team to The Finale at the National Harbor. And we have one team attending the US Finals in VA Beach. Two of our teams won FIRST place at Battle at the Capital right here in Fairfax!!! ALL THREE teams earned a first place bid to NATIONALS! We traveled to Virginia Beach for the US Finals and all 3 teams are Nationally Ranked!! All teams competed against some tough teams! 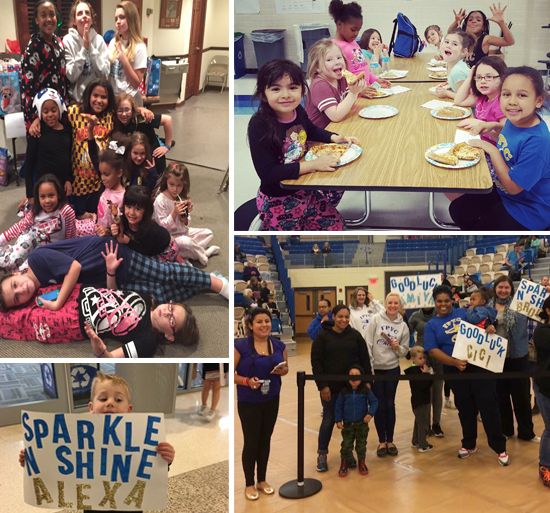 Sparkle, Glitter, and Dazzle and these teams SHINED!! We traveled to Maryland Regional Competition, Battle at the Capitol and ECDA Nationals in Williamsburg. All three teams excelled and improved with each competition! Our Girls Did a Great Job!!! 2009 marked the first time that FPYC has offered a competitive Select Team. We had 9 girls ranging in age from 6-12 compete in two major competitions. In 2010 we were proud to send three teams divided by age to three competitions giving us a total of 38 girls! 2011 We currently have 32 girls and have two teams competing. It is awesome to see how these young teams have grown in such a short amount of time! The skills are getting more complex and they are rising to the challenge! Competitive Cheerleading is very different from the world of Game-Day cheerleading. Competitive cheerleaders learn routines put to cheers and music that involve more difficult stunts, dancing and tumbling. The team practices during the week and travels to competitions around the state. At these competitions, the squad will face-off against other cheerleading squads in their division. They are scored by judges and perform for large audiences. Because of the intensity of this sport, we recommend that athletes who are interested have some prior experience cheerleading before signing up.